We offer a one bedroom, two bathroom 'up-down' oceanfront condominium at the world famous Kapalua Bay Villas Resort. The bedroom is upstairs, with two panoramic views of the island of Molokai across the channel and the Maui coast. With no one above or below, there is never any patter of little (or big) feet to disturb the tranquility. Gentle trade winds and beautiful sunsets make this a true paradise. Easy access to golf, tennis, snorkeling and scuba, surfing, hiking, etc. Stunning views of Oneloa Bay, the Pacific Ocean and the neighboring island of Molokai and just a short walk (7 to 8 minutes) from Oneloa Bay Beach and also Namalu Bay. Two private swimming pools that are 1 and 4 minute walks away. We are independent transportation policy, finance and environmental consultants (Don since 1982 and and Sarah since 1994)whose clients include Federal and State agencies, local governments and private companies. We are longtime residents of Los Angeles and have traveled extensively in the U.S. and Europe. We enjoy golf, biking, hiking, reading, jazz, and good conversation. Our oceanfront place at Kapalua (Bay Villas 36-G-5) is a quiet and private pied-á-terre in one of the most beautiful settings imaginable. 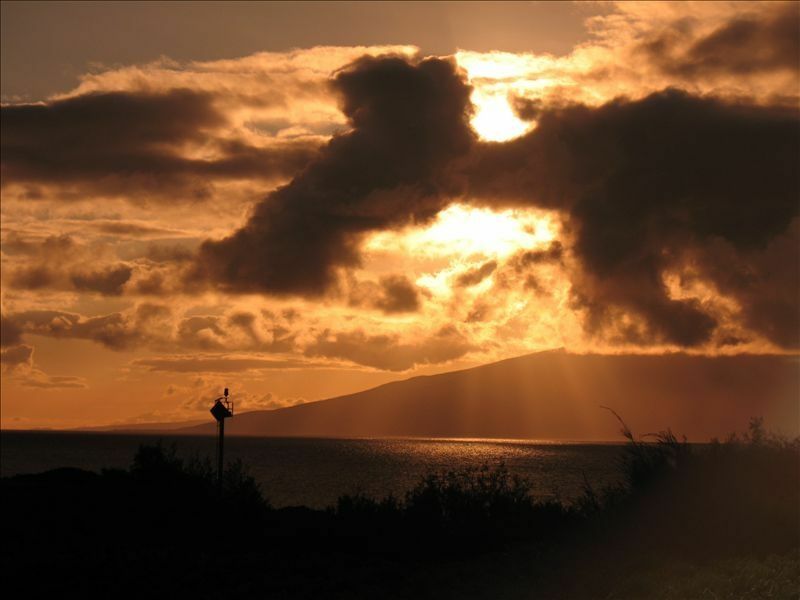 Our panoramic views of Molokai, the channel, the Maui coastline as well as fantastic sunrises and sunsets make every day here special. Two world class golf courses, great hiking and ocean sports of every kind, terrific restaurants and shopping make this a truly unique location for a vacation. No matter how many times we come, it never gets old!! 42' Sony Bravia Flatscreen in living room. 2 convenient pools with gas grills, deck chairs, etc. One with ocean view. The condo is simply wonderful and Donald is a kind and helpful owner. The whole process was a breeze. We wished we could have stayed longer. Could use an upgrade on cookware and countertop appliances. Loved it otherwise. The condo is a two-floor townhouse, end-unit. The first floor is a open plan living, dining and kitchen area. It also has a small bathroom with a shower. The second floor holds a good sized bedroom and a very nice, well appointed bathroom. The place is very well laid out with lots of windows so you can enjoy eye-popping views of the Pacific from every room. Don (the owner) send us excellent instructions to help us find our way from the airport, through the security gate for the condo community, and then to the condo itself. He was also promptly available by phone (and very helpful) when I had trouble turning on the TV. All in all, I give it an unqualified excellent recommendation. What a fantastic location. The views are amazing. Close to the Kapalua trail, that we walked every morning. Walking distance to the best beaches on Maui. The property has multiple pools, we chose to walk to the one overlooking the ocean, loved it. Donald the owner was fantastic, very organized and great communication. He sincerely wanted us to enjoy our stay and we did. Wish we were there there right now. This property is in a very good location. It is close to one of the swimming pools. The beaches require a pretty long walk and the walk is not easy (depending on age). The villa does not have beach chairs or an umbrella and only had two beach towels. It has fantastic views. “This property is in a very good location.” We totally agree. “It is close to one of the swimming pools.” In fact, our villa is a 45 second walk from one pool and a five minute walk from another. “The beaches require a pretty long walk and the walk is not easy (depending on age).” I am 71 years old and not especially spry. For me, Kapalua Beach is a 6-8 minutes walk, and Oneloa Beach 8 to 10. “The villa does not have beach chairs or an umbrella.” We try to keep two beach chairs in the unit but they have a habit of disappearing. We are always happy to have guests buy a pair and we will reimburse. Guilty as charged on the umbrella. “[The unit] only had two beach towels.” In fact, there are several beach towels in the master bathroom, so we’re not sure what this is about. “It has fantastic views.” Indeed, they are fantastic. We have stayed in several models like this one in previous years. The remodel and upgrade this owner did is superior and improves usage of space. The downstairs living area is expanded and the bathroom includes a shower. The upstairs expansion provides a panoramic view from Kapalua to Honolua Bay, we could see the masts of the catamarans in the Bay. It includes two seating areas, we never closed the upstairs shades! The upstairs bath is also upgraded a very spacious. The area is quiet, just steps away from the coastal trail to the beach. We also used the grill in the pool area. Plenty of towels, soap, shampoos, hairdryer are included as well as glasses, dishes, utensils and cookware, and all kitchen appliances. Owner is very easy to work with, provides all information needed and responds quickly. We truly felt he wanted us to be comfortable and enjoy his unit. Definitely the place to stay our next trip to Maui! Cancellation policy: The initial deposit is refundable in full if cancellation is made at least 60 days prior to date of arrival. If cancellation occurs after said date, the deposit is non-refundable, except that, in the event that the unit is rented for a part or all of the period covered by this agreement, Lessor agrees to refund the deposit by an amount equal to net proceeds realized from rental of the unit, except that such refund shall not exceed the amount of the deposit. The Security Deposit (400.00) will be fully refunded no matter when cancellation may occur.